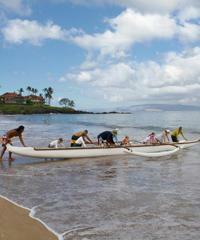 The Maui whale season begins on Dec 16th and runs till the middle of May. 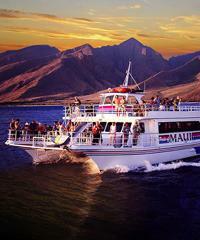 Maui Whale Watching tours are the pride of the winter season. 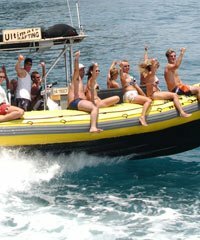 We offer many of these excursions at discount pricing. 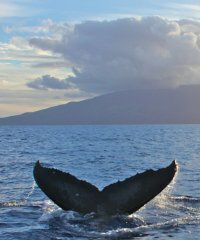 Every year the Humpback whales return to Maui and its surrounding islands of Molokai, Lanai and Kahoolawe to enjoy the winter months. 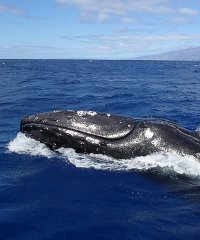 After feasting on krill and plankton in their home waters off Alaska and Canada over the summer season they make the enormous trip all the way to Hawaii to mate and give birth to their young. 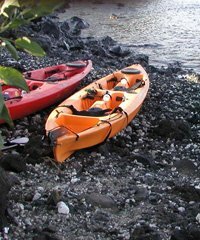 The times spent in these waters are akin to time spent on vacation as they mostly rest and enjoy the peaceful days luxuriating in the Maui sunshine. To be sure, there can be some tense moments as the males of the species can act aggressively toward each other as they vie for the companionship of the females but these moments are few and far between as the pods generally enjoy the serenity of their Hawaiian holiday. Whale Watching Maui: Where From? When? How Long? Do We Always See Whales? 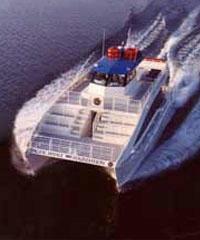 Most of the many whale watching tours are two hours in duration. 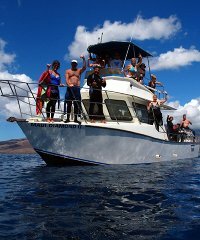 During the heart of the Maui whale season between January and March the likelihood of seeing whales is almost 100% and many boats will take you out for a free ride again if you do not see them. 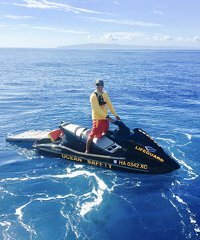 Between May 16th and Dec. 15th when whale season is not in effect, fast moving motorized boats such as jet skis and parasail boats are permitted in the whale sanctuary zone. 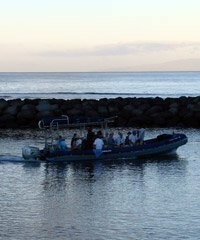 Maui whale watching tours depart dozens of times during each day during the winter whale season to view the spectacular Humpback Whale. 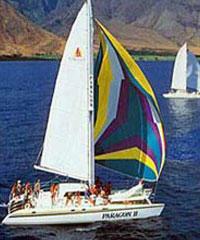 During the Maui Whale Watching Season this is the best location to see whales in Hawaii. 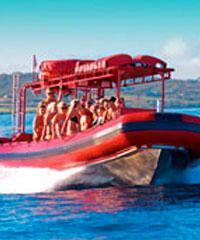 Maui and its surrounding islands of Molokai, Lanai and Kahoolawe are actually the very top of one mammoth underwater volcano and just at the very peak of this mountain are the various islands delineated by shallow waterways which separate each of the islands. These channels between islands provide shallow and warm waters for the Humpback Whales to enjoy after their long and arduous journey each year from Alaska and Canada. 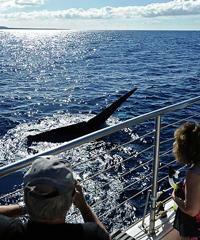 The Lahaina Roadstead area and Maalaea Bay are something akin to a resort to these amazing whales. Rather than spending all day pressing on in their incredible marathon swims from Alaska or spending all day searching out food in their home environment they instead spend their days lounging in these protected waters slowly swimming about in pods, going through the mating rituals as they court one another and giving birth to whales that were conceived the previous year. 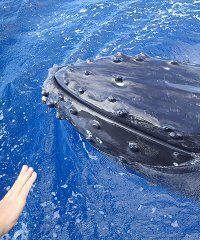 The Humpback Whale has come for generations to this area between the islands of Maui County and spends its days here mating, giving birth and nursing their young. 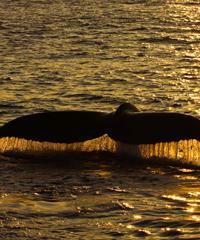 Humpback Whales don't eat a thing during all the months they are away from Alaska. Whale's' lungs are the size of a Volkswagen! 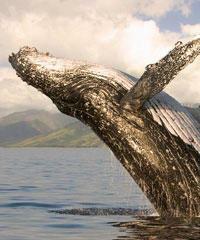 Whales' babies, born here on Maui, grow at a rate of 100 pounds a day! 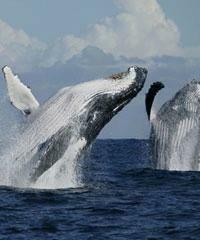 Adult Humpback Whales lose about 25% of their body weight during this period. 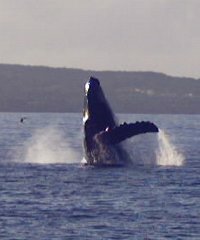 Humpback Whales spend the majority of their day below the surface of the water and just come to the surface to breathe. 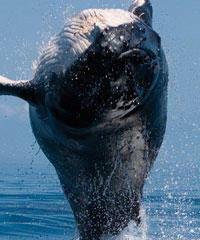 Though these whales can stay down for as long as 45 minutes, their average dive time is about 10 minutes. 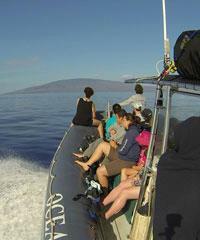 We can hear the whales "song" on hydrophones from Maui's whale watch boats. Remarkably, all male whales will sing the exact same, but very complex, song at the beginning of the whale season and this song will change in the same way for all of them as the season progresses. The next years song will begin where this year's song left off. 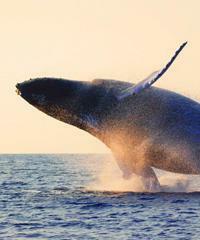 No one really knows exactly why the Humpback whales sing these songs or what they mean. 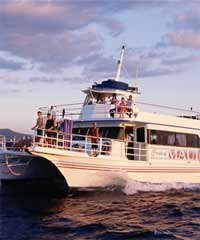 The Maui Whale Watching Tours will not pick up at the cruise boat pier but these seasonal whale excursions can be reached via a Rent-A-Car that can be arranged through Tom Barefoot's Tours and you can be picked up by the Rent-A-Car shuttles right at the cruise ship dock. 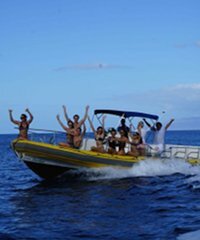 These Whale Watch Tours are available on the Sunday and Monday of your Maui cruise itinerary..
Is There a Better Time of Day to View the Whales on Maui? 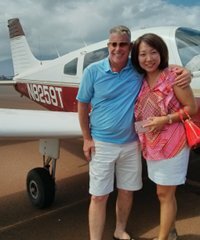 Private Whale Watch from a Sightseeing Plane on Maui? Great trip. 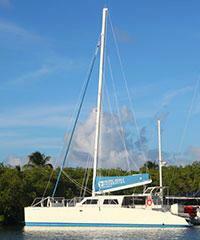 The crew was very knowledgeable and kept the little children interested. 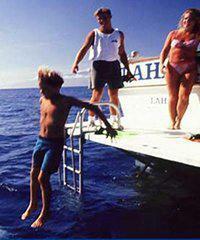 What a great thing to do to learn all about whales. 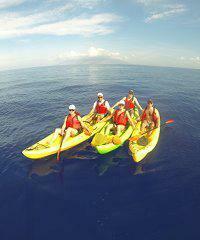 AN ABSOLUTE MUST TOUR FOR ANYONE IN MAUI!!! 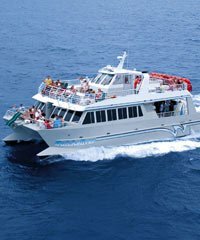 If you're looking to do some whale watching in Hawaii, the island of Maui is probably the single best place that you can go to see them. The whales as you may know, they visit here annually. They come from the north, they come from Alaska, they come from Canada. 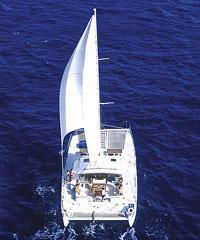 The humpback whales are the ones that we're referring to. 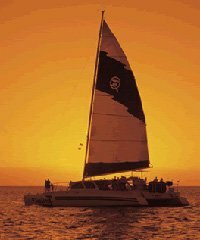 Their main home is up north but once a year they make this incredible passage all the way across the Pacific, over 2,000 miles and they find the Hawaiian Islands. 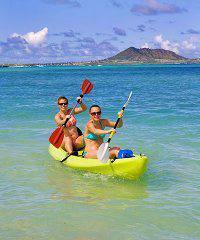 They cruise the Hawaiian Islands. 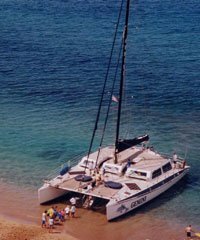 They go to all of the different islands but generally speaking they end up on Maui or in Maui County in the channels between the islands here. They're pretty remarkable, this entire travel that they have. The entire time that they're gone they don't eat. They eat krill up in the north but all the way here they don't eat anything, and the entire time they're in Hawaii they don't eat either. It's not until they return later to Alaska that they actually eat again. Essentially they're coming here kind of like a vacation. They come here to mate and to calve, and just generally seem like they cavort about and lazily enjoy themselves, wandering about in pods throughout the islands. They can be readily seen on all days of the winter. They're here primarily, the big timing is between December 15th and May 15th. Really the bulk of them are here in January, February, March, late December but really January, February, March. Some of them get here early. 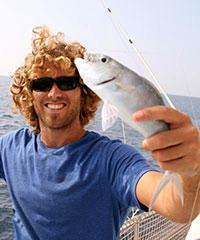 Some of them are, the first ones are usually spotted oftentimes in September. The last ones are leaving in May. Most of them moved out by then, but the big whale season is really that January, February, March area although you can see whales in April and in May, and you can see them in December but they're on the outskirts of the scale. 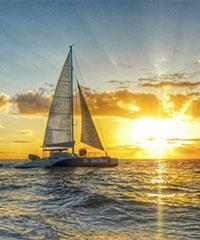 This is where they come and they're wonderful to see, and we have many boats that go out to see them. 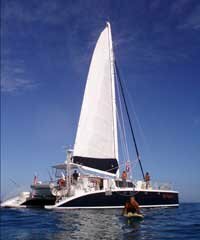 The boats that we have, and let me show you a picture here. 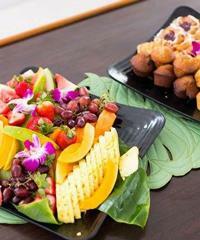 This is Maui County. 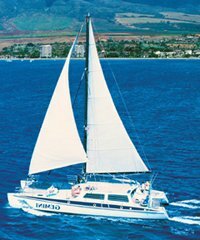 The majority of boats we have will be leaving from either Lahaina or Mala right next door here, or Kaanapali, this coastline, or from Maalaea Harbor. These are the main places that we have to go out looking for whales. These are the channels and the channels are very shallow, about 110 feet in this channel, maybe 600 feet in here. All the water around here goes down thousands of feet. 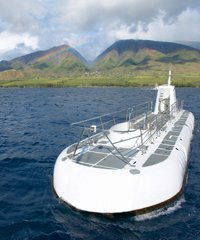 I think that possibly they may like the notion of being in a narrow channel, not narrow but shallow channel, and that's why they end up at Maui County. I don't know that anyone really knows. I know that whales are in all the islands. You can find them. 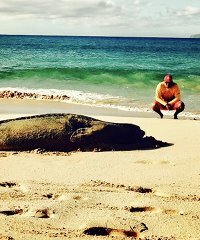 They found whales that have been on the Big Island here and then two weeks later the same whale showed up here on Kauai. They do travel. I don't know if they all necessarily come back to the same islands, that they have their favorite spots. But if you do a count, generally speaking it's going to be more in Maui County than on the other islands. 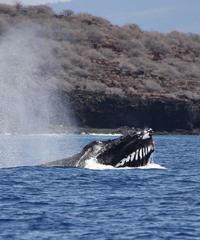 So you're fortunate to be on Maui during whale season to go out to see these incredible animals. 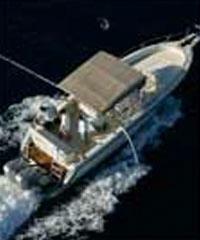 We have many different types of boats that go out. 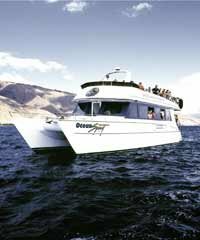 Generally they're going to be just a couple-hour tours, these whale watches, and the Type of Boat that you would be interested in is really based on your preference. A lot of people like the larger boats. 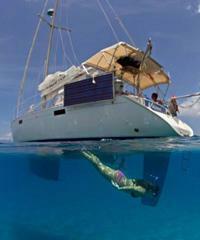 They're more stable in the water. Some of them are two levels so from up on the top, you've got little more of an observation of the whales, a little bit more perspective. So those are popular. 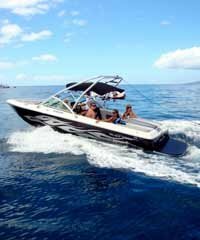 But we also have the smaller boats like the Radons, the Zodiacs, boats that are very fast and maneuverable and carry smaller groups of people. These are a little more adventurous. They get around quicker through the channels. 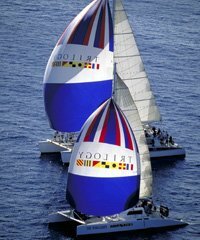 In some ways that can be important because the idea is you're going out, you don't know exactly necessarily know where the pods, they travel in pods, of numbers of whales, you don't know where the pods are going to be. You get out there, you may know where they were last time you were out. They may still be there but things will change, and so you get there and you're looking for the whales. The idea is when you see them, you want to get over to them. The faster you can get to them, the better off it's going to be because you're going to have more time observing the whales. You're not going to be able to get right on them. That is not permissible. We want to leave the whales alone, allow them to have their space but we can get within 100 yards and then just stop and then really get a good view of them. A lot of times what happens though is the boats are not allowed to get close to the whales but the whales don't have any problem sometimes just coming right up to the boats. 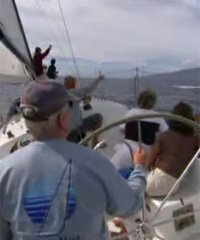 They do it all the time and you can sometimes be just, oh my gosh, you're just right off the bow of the boat or the stern or they're going underneath the boat. It is amazing to see these incredible whales. A lot of times they'll be docile but other times they're out there doing their breaches where they just go high up into the air, come down and slap the ocean. A lot of theories I guess on why they do that exactly. Sometimes actually you can witness really aggressive tendencies in these pods where there seems to be fighting and so on among the males. Then you're going to come across pods that have the little babies that are just so beautiful and so cute. 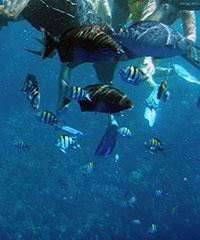 So you never know what you're going to see out there but it is one of the spectacles that Maui is famous for. 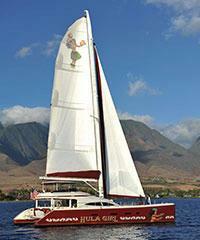 If you're coming to Maui, you definitely should consider doing a whale watch because they're just the best. 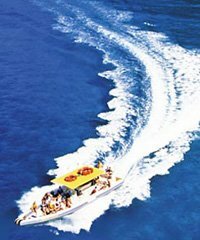 Unlike other locations in Hawaii, the Big Island of Hawaii is not only the seasonal home for the famous Humpback whales but is also home year round to a selection of Sperm whales, Pilot whales, Pygmy Killer whales, the Melon Headed whales and the rare Beaked whales.